On the 2nd birthday of Tribal Wars 2, an unexpected arrival agitated Paul the Paladin: the mighty archer Gwendoline! Her skills impressed our capable warrior and invited her to induct you in archery. Since then, Gwendoline accepted all Paul’s invitations and appeared many times at Tribal Wars 2. But Gwendoline is not only skillful at archery; she’s also generous. When she schedules an appearance, except her bow, she brings with her generous rewards! Her rules are very simple: you have to use your bow, shoot at the wheel and win the related item. 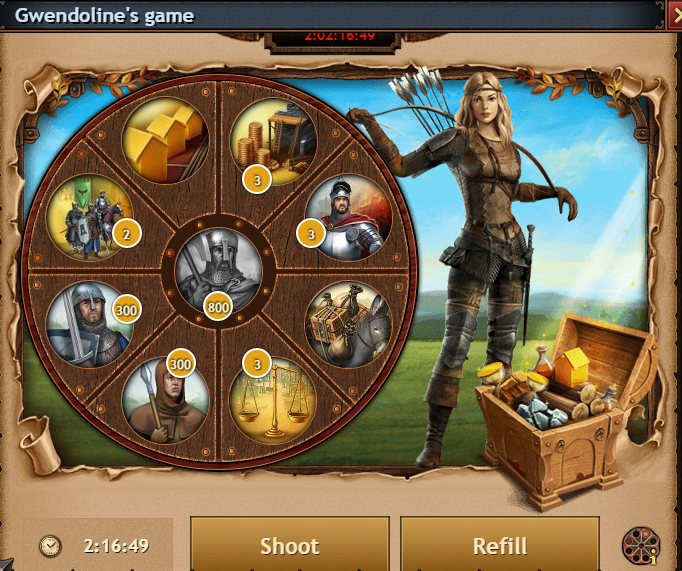 Each day, Gwendoline gives you a free shot which is stored at your Inventory. You can use the free shots until the end of the event. After that, all unused free shots will be removed from your Inventory. If you win Noblemen at Gwendoline’s event, you still have to mint the equivalent Coins for these Noblemen. You only gain the needed resources for training these Noblemen. Not the resources for their Coins. The most valuable prize, is Bountiful Season. With this item, you can increase the Farm space of one village by 20%. Permanently! All the above prizes can be won at the wheel with the same way: shoot at the wheel and win the related item. After your daily free shot, you have to pay some Crowns for each next shot. The first paid shot cost 30 crowns and each following shot will cost 30 crowns more than the previous one. And if your still eager for more awesome prizes, you can simply refill the wheel’s prizes using the Refill button at the lower right corner of the event screen! 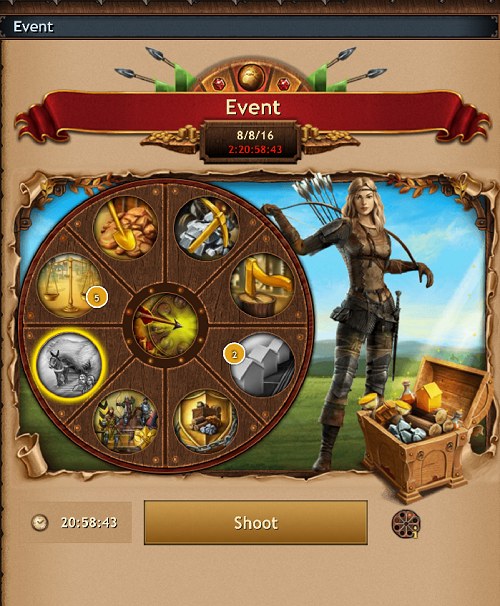 By refilling the wheel, you’ll be able to win all previously won prizes on today’s wheel. By refilling the wheel, you won’t get a free shot. You’ll be able to refill wheel’s prizes after you shot at least once at the wheel. Each Refill will give you the same items of the specific day, regardless how many times you used it within a day. Next to the Refill button, there’s an icon. By putting the cursor on it, you can see useful information about the event. At the lower left corner of the event’s screen, there is a timer. From there, you can see when the wheel’s prizes will be refreshed with new ones! In the middle upper side of the screen and below the event's title, there is a timer. From there you can see when the event will be end. Never forget to use your cursor! It can give you useful information whenever you hover it above an image, either the reward is a booster, an Officer or unit package. This page was last modified on 29 May 2018, at 15:13.